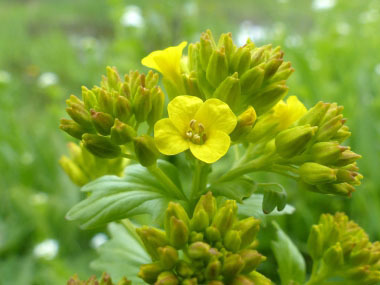 Yellow rocket is a perennial that flowers from May to August and adds colour to fields, gardens and roadsides. This plant is often confused with wild mustard but it can be distinguished from wild mustard by its smaller, deeper golden yellow flowers, hairless leaves that are a glossy green or may even be slightly purplish in colour, the large terminal lobe within the leaves. 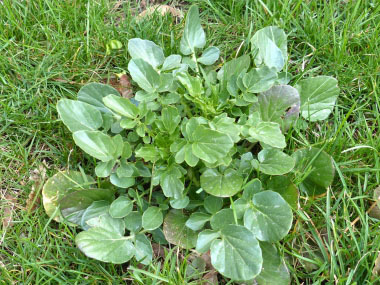 If the winter season is not too severe, this plant can be found and collected throughout the winter. Sometimes it even stays green underneath the snow. 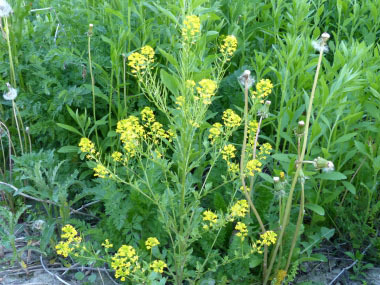 Distinguishing Features: Yellow rocket has bright golden yellow flowers, shiny green leaves (may also be slightly purplish in color) with lots of small leaves and one large terminal lobe. Flowers: Yellow rocket flowers are yellow and often appear in a cluster. Each flower measures 1 to 1.5 cm across. The flower has four petals generally appearing in the formation of a cross. The flower has six stamens, two are short and four are long. During the second year of growth flowers can occur at any time once matured. 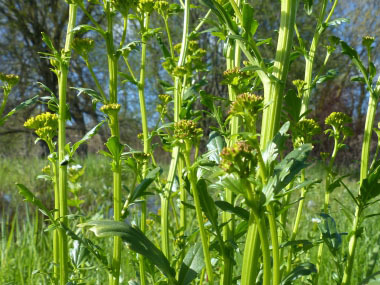 Fields of Nutrition has medicinal benefits and vitamin/mineral content of Yellow Rocket. Leaves: Long-stalked and hairless, shiny dark green leaves, basal leaves measure 5-20 cm long, lobed with one large terminal lobe and one to four oppositely-arranged lateral lobes. Terminal lobes are heart-shaped. At the top of the plant the leaves are much smaller and less lobed. All leaves are alternate with wavy and toothed margins. Height: 20 cm to 80 cm. 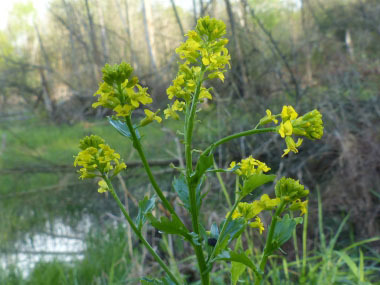 Habitat: Yellow rocket can be found in moist meadows, pastures, amongst crops and fields, gardens, vacant lots, construction sites, along roadsides, and throughout waste areas. 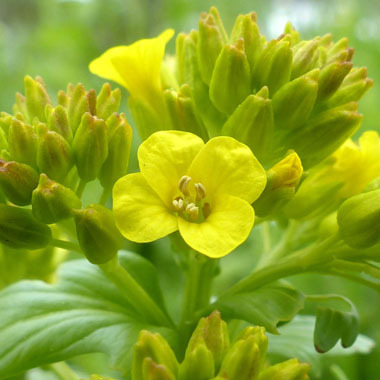 Yellow rocket especially likes moist rich soil. Edible parts: The basal leaves are edible early spring but later become bitter, although still edible. At this stage they can be chopped up and added to salads like rucola, which has a similar tang. The leaves can be cut up fresh over salads, older leaves can be used in stews or soups, or you can dry the leaves to make tea. Flowering stems can be cooked like broccoli.